Professional conference organizers and event planners that need web planning solutions that can be skinned to your branding requirements. Works perfect for planning teams. Publish to Web and mobile! Grenadine Event Planner Reviews Recently Reviewed! Comments: I just finished planning an academic convention in Baltimore, MD, using Grenadine Events. We had 865 Registered People, 885 people in the program, and 224 different items listed within the program (just to give you the size and scope of my convention). 1) My participants LOVED the website version of the convention. Even the convention hotel staff said it was one of the cleanest online website programs they had ever seen. 2) The participants also loved the AP version. 3) The amount of time this software saved me on finding conflicts was my personal favorite feature as the convention planner. I've heard horror stories related to finding all of the conflicts, but this software made dropping a panel into a time slot and instantaneously finding out if there were conflicts a cinch. 4) Overall, the learning curve for my needs was pretty fast. 5) The customer service at Grenadine is amazing. Any time I had a question, I had a response within 24 hours, which kept me making progress. 1) Registering on the website and creating an account was a bit tricky for some. To register as a specific user, you had to have the e-mail address that had been given to me by an associate planner. Unfortunately, many of the participants had no idea what e-mail address I was using, which caused some frustration on their part. 2) To make a participant "live" in system, the individual had to uploaded and indicated that he or she had "accepted" an invitation to the convention. With my association, by the point I'm programming everyone is accepted. I wish this had just been the default. This was just one other step that didn't seem too necessary. Overall, I would recommend this software to anyone planning an academic convention. This product made my job a lot easier. Even the "cons" I have are minor ones that really didn't impact my ability to successfully use this software. I'm happy to say that we've since addressed your con #2 (you can now assign anyone to a calendar item, and we now automatically mark them a speaker as soon as we notice the assignment, without having to "accept" them). We are always working to make identifying people an easier task, regardless of which email address they use, which is something that should gradually improve over time as we "catch" more and more ways to figure out who a person is, regardless of how they spell their name, if they use their middle initials or not, or which one of their email addresses they use. Pros: The cost is lower than others on the market offering this level of functionality. I loved the sub-items to group activities/sessions occurring at the time and the ease of use to add sessions. The app interface is also very user friendly. They also offered easy links to embed the event on my website and include it in external emails. Cons: Attendees only show up in the public list if they have taken the time to create a profile and approve it for public viewing - which meant that 3 of my 135 attendees showed up on the app. As far as I could tell there was not way to override this - so I created a pdf file and added it as a document. Overall: Customer service was excellent. They also have a lot of information on their website (although it could be more searchable) but emails and phone calls were instantly addressed. I would use this software again for future events. Thanks Heather a lot for this great review. Interesting point you bring here. Well noted. We will definitely take this into account in a future release. Pros: overall ease of use -- particularly the ability to take information from a previous event and import it into the new event. I'm still learning about the survey functionality, but it seems robust. Overall: I have used this produce since its inception, as both an end-user and project manager. It has consistently improved, with additional functionality and improved user interface every time I use it. The customer support is outstanding, and questions I've raised have often led to new features or updates of existing features. Basic data entry options include importing spreadsheet files. Options for notifications are easy to use. The mobile app is easy to use, and is not a drain on data or battery life. The website functionality is something I haven't used much, so I can't really comment on it. And I haven't used the individual sign-up/sales options at all. Comments: 8000 attendees, 1,200 activities, 900 participants, 5 days - in London's excel are the figures behind the World Science Fiction Convention, with a geographically dispersed team of volunteers and participants from all five continents. Grenadine is the cloud based conference planning system that provides the planning and delivery structure to our activities and manages the complexity that arises from the vast amount of information that goes into formulating our convention. The simple and easy to use dashboard holds so much complexity and depth, that it is hard to fathom, until one sees into how much work the system does for the user at all levels. Grenadine helps reduce time and effort, by collecting our data, using dedicated questionnaires, helps us interpret this data, allowing our whole planning team to have visibility and match participants to programme items. We can query the database, set filters for enquiries, pull out specific pieces of information and the system will provide a multitude of reports. 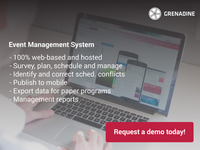 Grenadine also manages the data ;space, time, people, and equipment - highlighting and alerting one to conflicts in real time and providing the method to reassign a resource easily to prevent any issues. be it native iOS and Android apps that interface directly with the planning system and with our print publications, which receive an extract of the convention schedule in a format suitable for pre-press software. Effecting changes, at all stages is very easy, the system lends itself too being user friendly, while the amount of resources it creates from the data quickly resolves issues that were incredibly frustrating. Most importantly, it allows continuous viability of progress, and allows the team a simple way to be part of a complex process, and through the outputs, be a real benefit to all attendees of the convention. I have been using Grenadine for years, and have used nearly every feature they have available. Pros: There is a small learning curve, but once you start poking around the system, you realize how easy it is to use. I also like the flexibility available when contacting participants. The items tab is also very intuitive on how it works, and the scheduling grid makes scheduling items a breeze with the drag and drop capability. Cons: I would like more written instructions, especially for new features. However, their tech support system is very responsive and quick to answer questions. 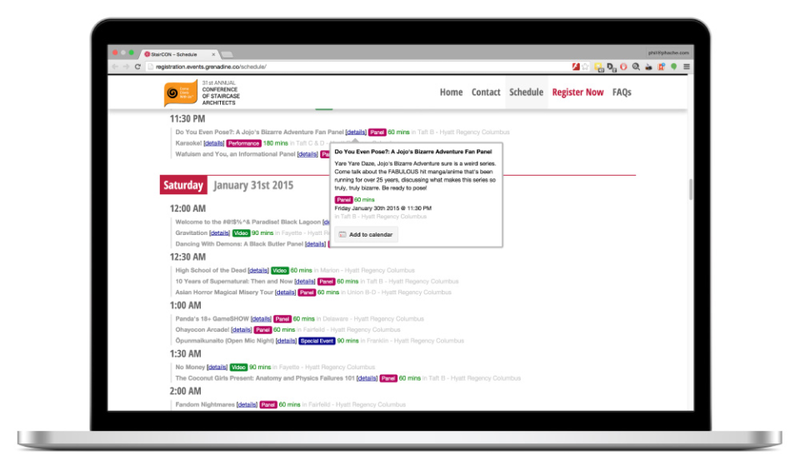 Pros: Grenadine makes managing the details of our convention organized and intuitive. Being able to edit/input data in one place, and have it accessible for all of our team members, as well as, updating the website and app, is invaluable. The team is also incredibly responsive often fixing bugs or issues the same or next day. We have been using Grenadine for 4 years now and have been very happy! Cons: There are often funny little bugs that pop-up now and again. (Although the team is quick to fix them.) I also wish there were more customization options for the website and app, but I understand they are working on these features, as well. All this being said, the pros far outweigh the cons! Pros: Excellent and responsive customer support. Love the programming grid, ADORED that I didn't have to cross check double bookings myself. Cons: There are still some bugs that need to be worked out and some features I'd like to see added but they listen to users' suggestions so I'm confident if I suggest them I may see them soon. Overall: We organize a few events per year, among which, last year, one 800-people conference. The Grenadine people were always there to help and support, and even modify the app according to our suggestions and needs; they even managed to help us with our own administrative problems. From our point of view, it is THE scheduling app and team that everyone wants to work with. We could also have expected to pay a lot more for what we got. Wonderful experience. I would recommend Grenadine to anybody. Pros: We plan large scale conventions where we have up to 15 events happening at the same time. Grenadine is indispensable. Checking the grid and seeing if we made any errors in double-booking has truly made our jobs easier. Cons: At times the reports are not my favorite, but I can still work with them. Grenadine was an essential tool for scheduling and organizing the program for a large-scale event. Pros: Grenadine gives a clear view on what is possible, both time- and people-wise and prevents from double-booking people/rooms. The customer support was absolutely amazing! Cons: The learning curve in the beginning was a bit steep, and the documentation could still be improved a bit. Pros: It's easy to input, scheduled, and coordinate talent - as well as alerting me to when guests are double booked or booked too closely together. Cons: Certain features aren't used by our organization, so it would be nice to remove those modules, however it does leave it open for us to explore those features in the future. Overall: As a long time event planner, I've used plenty of other softwares. However, Grenadine's Customer Support is what MAKES this program so great. I've asked for features, and they've been implemented. I have questions and they're quick to answer. There has never been a time I've wished for a feature that they didn't either explain how to use it, or then write it into the core program. I would suggest Grenadine to my other convention and planning teams without hesitation. Recommendations to other buyers: You may have to have someone walk you through the first few times, but their customer support is fantastic should you ever have any questions. User-friendly platform and great customer service! Pros: Intuitive system with many capabilities. It has created more efficiency in our day to day. Grenadine's customer service is fantastic. They offer fantastic solutions and they are always keen to help. Cons: Due to multiple report types, it can be daunting when try to pull the correct information. Overall: Efficiencies in our office. Ability to save information in an accessible and easy to navigate manner. We've really enjoyed using Grenadine. Pros: I like that it is easy to set up and looks really professional. I also really like the countdown clock prior to the event. And that it alerts attendees when an update has been made. Cons: That since I only have an annual event I have to start each year from scratch to build the info in. I am not able to pay to keep the data held all year. Overall: Your staff is really excellent and helpful. I would highly recommend this program to other event planners. Pros: Easy to use. I can easily mark what events I want to see, and then just sort on those. I can coordinate with friends. Always useful. I had to help with set up for one event. It was easy to get in, see what was happening, add my events, and assign my people. Cons: I've heard from friends that the iOS app has been having problems. An update has been sent to Apple, we have an event next week. Please update ASAP. Pros: I love the speed and flexibility. I move the location of a session or change a name of a panelist and, in less than 1 minute, I've published it to a mobile app and to my website. I can email 100s of attendees or just two with highly customized and relevant information in an instant. I also love the customer support. I had some needs for a specific report and they listened to me. In a couple of days I got it. Pros: Many elements can be translated. The features are user-friendly. The visual is nice. 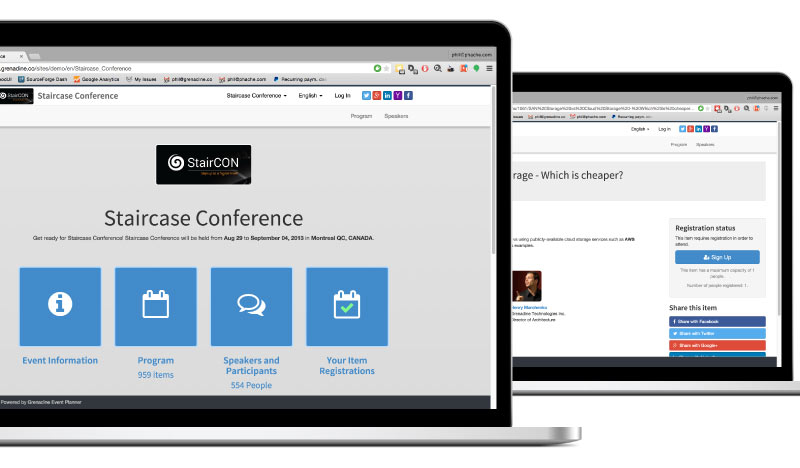 Having the conference website + the registration feature together is a plus for a small organizing team with less event planning experience. Cons: Some features were not transladable. Features sur as sponsors and speakers lack a bit of flexibility (e.g. categories of sponsorship should be an added option, categories of speakers should also be an extra option). Thank you Gabrielle for this great review with constructive feedback. We are progressively working on adding more translatable content. Well noted on the categorization, it's on our roadmap and is planned to be delivered during 2019. A Great Product That Improves All the Time! Pros: It's feature-rich and flexible. Cons: Because it is so feature-rich, it can be a little difficult at first. Overall: I have been using Grenadine for panel/people scheduling for years and find it an amazingly versatile product. The service team is extremely responsive and you frequently find suggestions you've made become part of the software. 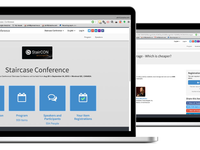 It is particularly invaluable for conference planners who are geographically dispersed. Since it's Web-based, the planning team always sees the same scheduling updates. The publish to Web feature for schedule and panelists is extremely easy and will always keep your event attendees up-to-date. Comments: I found the use of the Grenadine software to be liberating. I run a reasonably small event, we only have three to four parallel streams over three days. Before we started using grenadine we would occasionally have people on multiple events at the same time, and others barely used at all. The inbuilt reports on the software help us see when we are over and under using people. The inbuilt surveys also helped us ensure we didn't put people on items when they told us they were unavailable. It also allows us to have our timetable on the Web, and as up to date as possible. make a small change to our timetable, and we could publish it instantly! Recommendations to other buyers: I highly recommend this software to anyone who wants to run an event. While you get the best use by using multiple functions, even just the programming stuff made my life so much easier. Comments: For our conference, we utilized Grenadine's publishing features and received very positive feedbacks from our attendees. The web schedule is clean with multiple layout options and the mobile app, easy to use. On the backend, the usability is sometimes a bit clunky (i.e. a lot of clicks to change a description) and lacking bulk import / editing capabilities for all fields. Otherwise, the tools are very robust and discoverable. The customer service is A++, quick responses and as a growing company, very adaptable to feature requests. We regret not finding out about Grenadine sooner, thus not using the planning & registration features - but definitely will for our next big event! This is a much cheaper alternative to other platforms like Cvent. Cons: It would be good to have the functionality to have group discounts for multiple bookings, instead of having to have a separate ticket type for group bookings, as this sometimes caused a bit of confusion for customers. 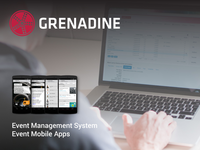 Comments: Grenadine is the perfect combination of event planner/management tool and front-facing website & app. The back-end interface reflects the ongoing relationship between the development team and their clients, based on their needs and requests, and the team continues to improve the app based on new needs. We have a very non-tech-savy convention planning team, and with only a little training, they were able to navigate successful through the interface and utilize it's many features. The participants in the convention also really appreciated the easy of use and overall cleanliness of the app and website. We look forward to using this system for years to come. 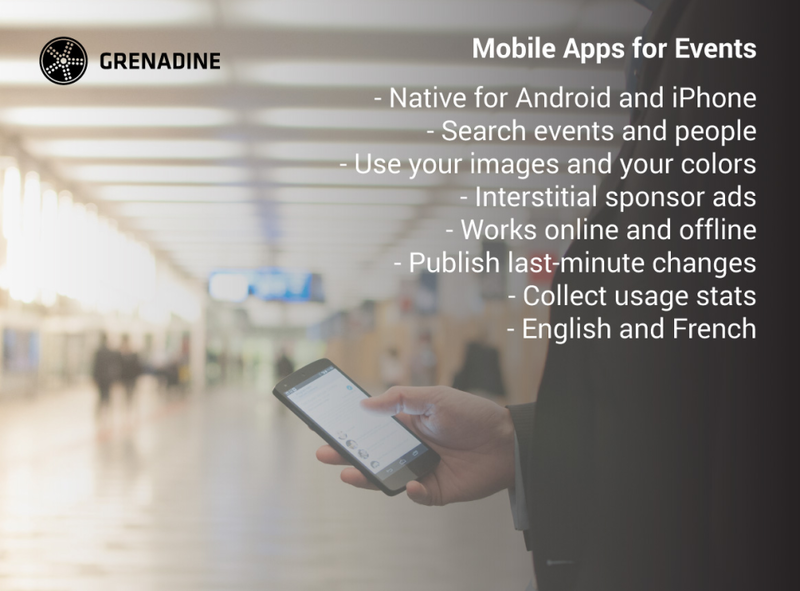 Grenadine offers a great mobile app for attendees. Pros: Great mobile app for publishing info to attendees. Cons: Schedule item tagging paradigm doesn't work and leads to tag proliferation. Overall: Most of my experience with Grenadine has been with configuring the mobile app. It not only displays the convention schedule in a searchable format, but makes it easy for organizers to add pages of other information such as a code of conduct or sponsor list. Comments: Grenadine is an excellent product. Before this option came around, we used to create our own applications for our customers. It was a lot of work and time to achieve the result our customers expected of us. The team behind this product is very mindful to the needs of its customers and is very receptive to our requests. Even though it already offers a variety of features, this platform is constantly evolving to meet the diverse needs of its customers. Comments: The software is easy very to use. The App is easy to use. Very pleased with the system as a whole. Grenadine staff is wonderful to work with. They are attentive, willing to work through any issues, they are open to suggestions for changes that would help make the software more efficient for every client using their product. I would highly recommend this product for any event planner who works on large or small events. Comments: We used this app for our User Group Conference to help organize our attendees and provide them with up-to-date information. We couldn't be happier with the end result. From start to finish, using this app has been very simple. 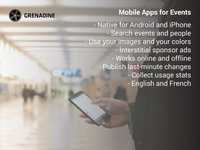 I strongly reccommend this app for anyone looking for an effective and low cost mobile event planning solution. Amazing Customer Service - makes my job easy! 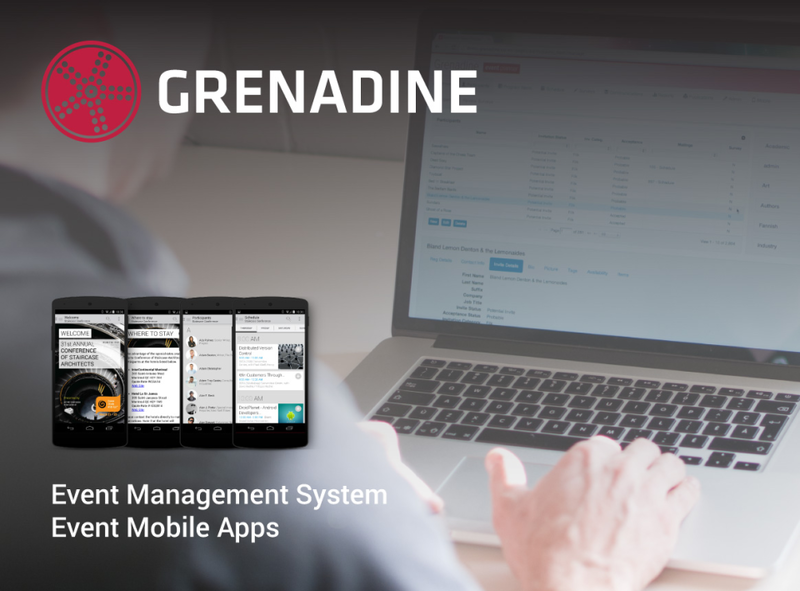 Comments: I've been enjoying how Grenadine has simplified a lot of event planning tasks. It's certainly making my job as a conference planner easier - allowing more time to plan the fun stuff. Comments: The app is very useful for all participants and for the planners. I much appreciate the continuous improvement of the functions and the help of the team. Comments: The attendees of our 2016 international Congress in Montréal have expressed an excellent overall appreciation of the Grenadine Event Planner.